and then ask you if you'd like another ride." No horse to kick me in the heart. I stand, and offer carrots. Copyright 2008, Christopher Watkins. © This work is protected under the U.S. copyright laws. It may not be reproduced, reprinted, reused, or altered without the expressed written permission of the author. 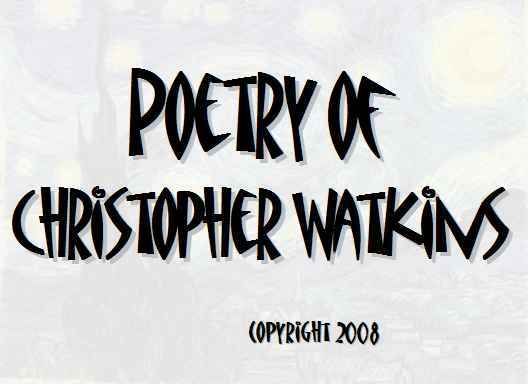 Christopher Watkins is a poet and songwriter. His poems are appearing or have appeared in Hayden’s Ferry Review, The GW Review, Slipstream, Euphony, Talking River, and Red Rock Review, among others. His collection of poems Short Houses With Wide Porches is forthcoming from Shady Lane Press. He was the Fall 2006 Writer-in-Residence at The Jack Kerouac Writer-in-Residence Project of Orlando, Florida. He is a graduate of the Stonecoast MFA Program at The University of Southern Maine.